Miles Witt Boyer Max Grubb Hark and Herald Coand Dress for Success Northwest Arkansas are teaming up to do something pretty cool. If you’ve never thought that your profile image, badge photo, or headshot could be the catalyst that could help change a life, we’re excited to invite you to do something truly worthwhile with your time. 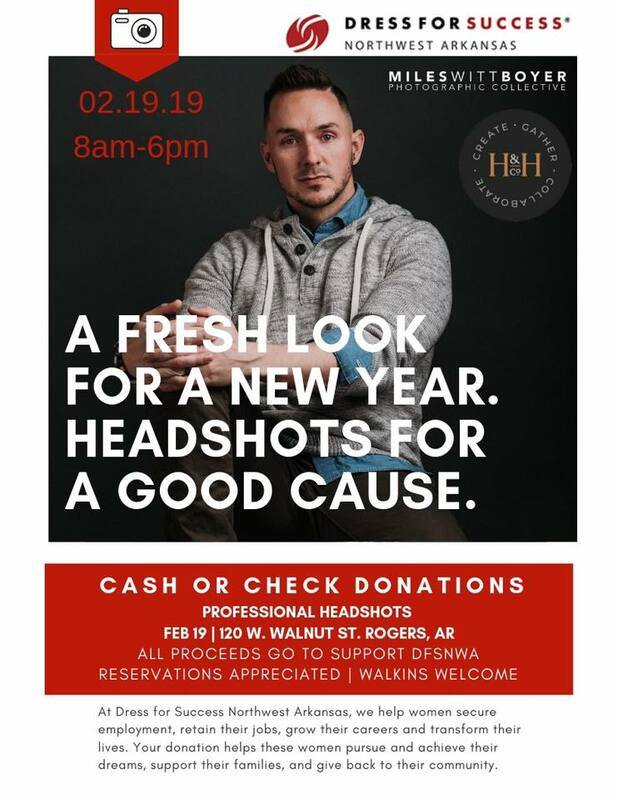 On Feb. 19th Miles Witt Boyer Photographic Collective, Hark + Harold Studios in downtown Rogers and Dress for Success NWA will be partnering to host an opportunity for you to refresh your headshot. The price is something you decide completely. CASH OR CHECK DONATIONS will go directly to helping end the cycle of poverty and support the women in NWA who are striving to make their lives, and their communities something more. Below you’ll find a link for reservations, however walk ins are completely welcomed as well. Please join us in supporting DFSNWA all while updating your professional look.